Happy new year folks. I know it’s a bit late in the day to be wishing you all, but better late than never right? I hope you’ve had a great start to this year because I just can’t wait to see what 2016 has in store for us! The past few months have been incredibly packed with work and personal events – all in a good way. The year ended with a big bang of a family reunion. We had a whole bunch of family visiting from Pune and the US – spent a crazy 3 weeks with everyone including my baby brother. I have to say, the best times spent together with the family were our long drawn out chai sessions. There were different kinds of chai going around at all times of day, because everybody likes theirs differently; but the one thing that each kind of brew had in common was that it was enjoyed best when a good family chat was served alongside. Morning snuggles in the razai with gossip from the previous nights dinner, a cup over breakfast while we decided what the POA for the day should be, a post-brunch brew to help digest the heavy paranthas we just consumed, the evening cuppa while the days events were dissected or the final wrap-up-the-day cup. Anytime is chai time. Period. 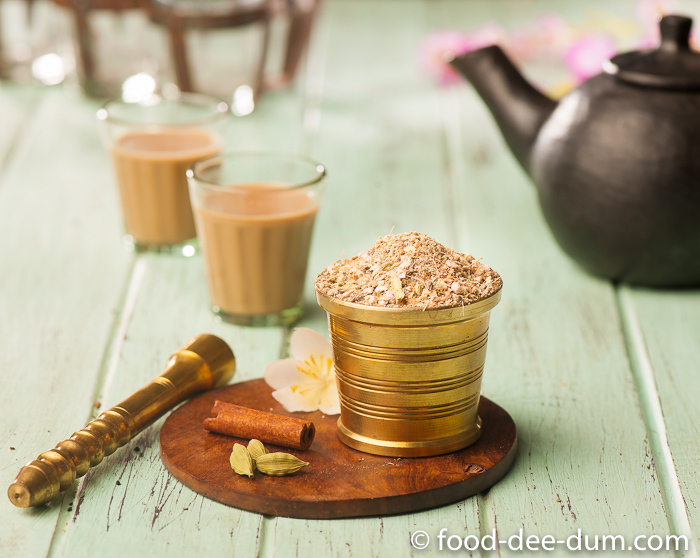 I blogged a simple masala chai recipe last year. To tell the truth, I didn’t know how to make a good cup of it until shortly before I blogged that recipe. My parents drink a very anglicised version of tea – a light brew with a drop of milk and no sugar. Since the time that I was allowed to drink tea (yes, there was an age limit in my parents house for some unfathomable reason), that’s the kind that I drank. 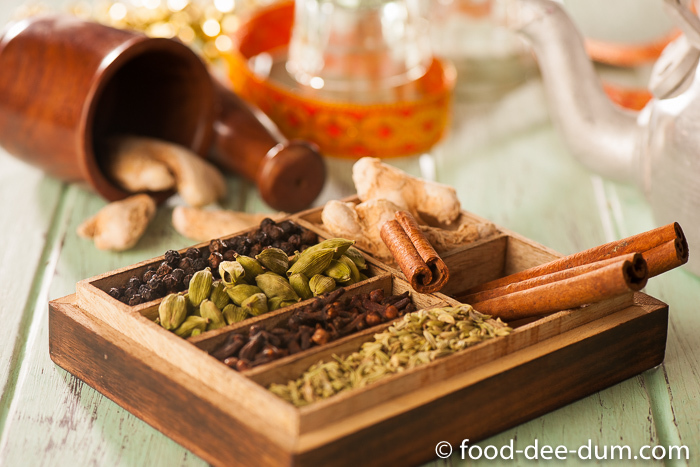 I’m not a picky tea drinker and would drink any kind that was offered but, over time, I began to prefer the desi version of chai – water, milk and tea boiled together, with or without spices and ginger. The kind made in most North Indian homes. The kind served at road-side tapris. The only kind my maid knew how to make. I made it a few times by myself with disastrous results – the milk split, got the water:tea:milk ratio wrong and ended up with a generally unsatisfactory cup most of the time. When I finally managed to brew a cup I liked, I was quick to blog it here. 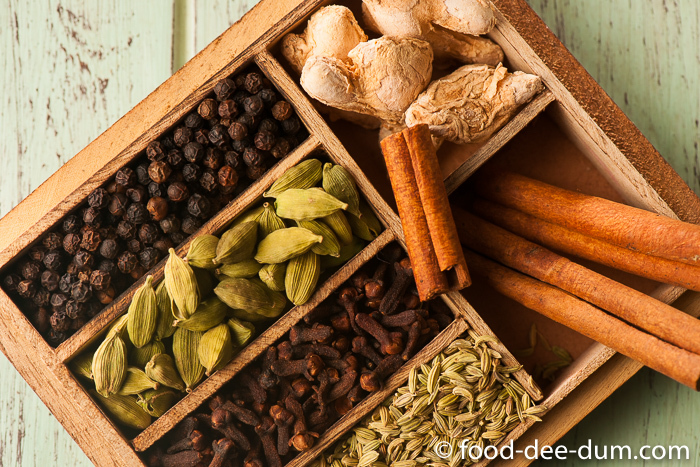 Making this masala in a big batch is largely an effort to save time on an everyday basis. Moreover, I wanted to do the math basis my recipe so I could make my brother a jarful to take back to Switzerland with him. Having gifted him a store-bought jar the last time, I was dissatisfied with the fact that it was a fine powder and, when it was time to strain the tea into the cup, I ended up with most of the masala in the cup. Also, it lacked a distinct flavour and aroma. So even though I didn’t get around to doing this before he left, I shall have an opportunity to send him a jar or two next month. In the meanwhile, I thought I could share it with you. 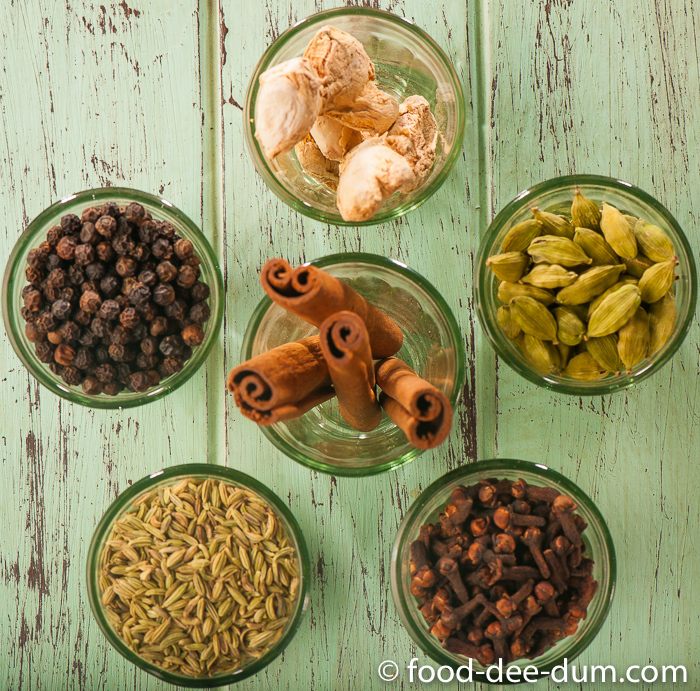 This is a great mix to have on hand for brewing tea at home. Or even as a personalised gift for friends. 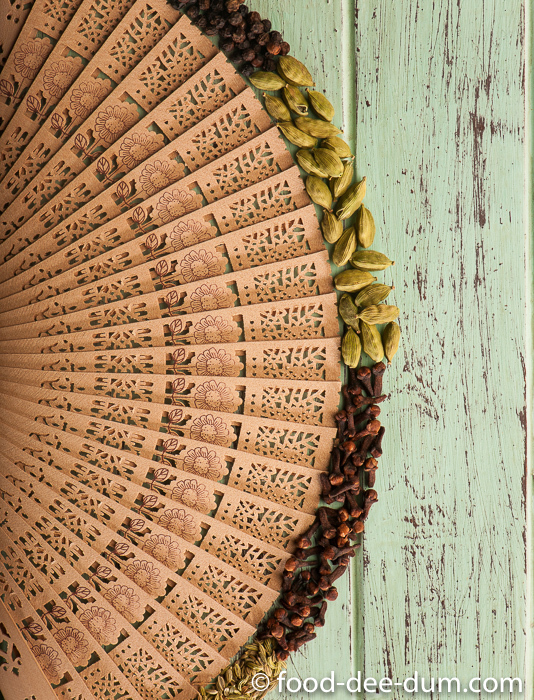 Been reading a lot of chai-spiced dessert recipes online? Don’t worry – use this mix for those recipes and it will give you great results. Whatever your reason, do try it for yourself and feel free to play around with the flavours to give it your own little twist. Because everybody likes their tea their own way. I want to pretend like there is some complicated method, but there really isn’t. All I did was to weigh out all the spices and grind them to a coarse powder in a mixie/ food processor. You can powder these very finely as well but, like I said, you will end up with a lot of the masala powder in the bottom of your tea cup. I found the ginger really difficult to grind, even though I have a pretty powerful mixie. So, instead, I grated it finely and then added it to the rest of the mix. In a pinch, you can use dried ginger powder, but that ends up causing the same problem – it’s just too fine. So, preferably, grate whole dried ginger or find dried ginger flakes. Add 2 tsp masala to 2/3 teacup water in a saucepan and bring to a boil. Add 1.5 tsp of tea leaves and 1/3 teacup milk to the pan. Add sugar, if using. Bring this back to a boil. Reduce heat, stir and bring back to a boil. Repeat 2 more times. Turn off heat and strain the tea into a teacup. Enjoy. 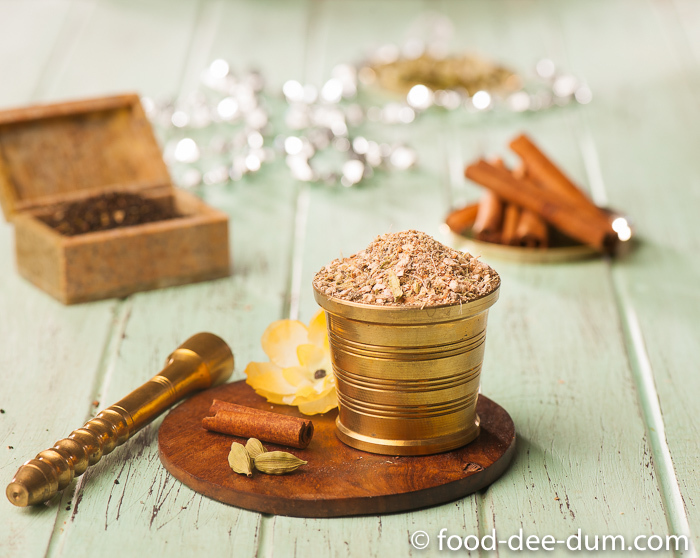 Note that if you choose to grind the spices to a finer powder, 6 gms may end up being less than 2 tsp. Make a few cups to find your perfect brew. Grate ginger finely and keep aside. 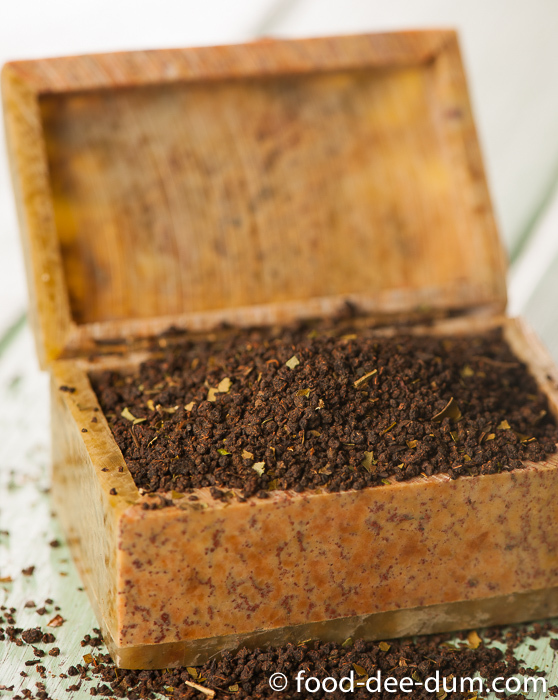 Place the other ingredients in the medium jar of the grinder and process to a coarse powder. Add the grated ginger to the jar and give it a quick whirl to mix. Use 6 gms (~2 tsp) for 1 teacup of masala chai.